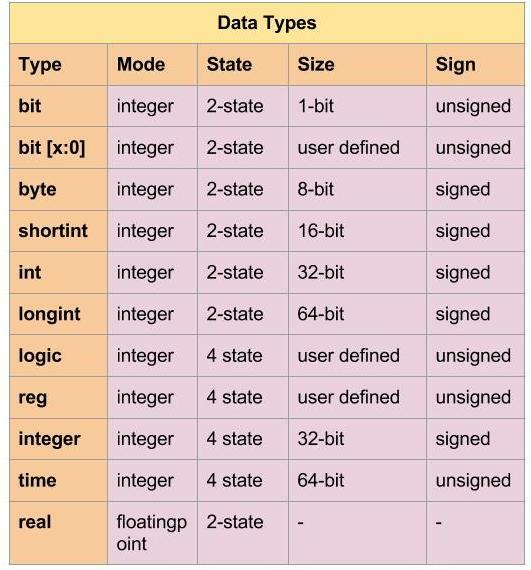 Friends, In this post I thought to present a quick reference for SystemVerilog (SV) Data Types which are the key elements in the foundation of any UVM based Verification Environment. Many of you would be already familiar with all these contents hence it may act as a refresher for you and my friends who are relatively new to SV can found it a point of beginning and take it ahead with the help of some excellent books and material available online & offline. Before proceeding, Let me mention that – we’ll focus on the data types or structures primarily most useful to the Functional Verification. As the name indicates, 2-value data type can have values as 0 or 1, yet 4-value data types can have values out of 0, 1, X, Z. 2-value data types are introduced in SystemVerilog and primary purpose is to speed up the simulation. But for the design use, its better to use 4-value data types to serves the purpose of high impedance state and unknown states. 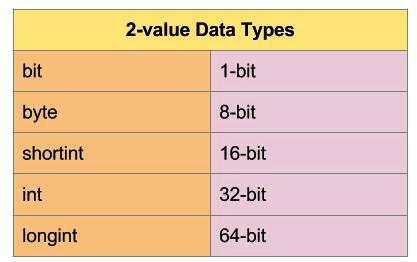 Different types of 2-valued and 4-valued data types are shown in the Table 1 & Table 2 below. Here I would like to talk little more about a data type that is introduced in the SystemVerilog i.e. “logic”. SystemVerilog improves the classic reg data type so that it can be driven by continuous assignments, gates and modules, in addition to being a variable. A logic type can be used anywhere a net is used expect that logic variable does not support being driven by the multiple sources e.g. bi-directional bus. In such cases, the variable to be declared a net type such as wire. Details of different valued data types are shown in Table 3 with their mode, sizes & default sign. String data type in SystemVerilog is a dynamic collection of characters. Each character of the String variable is of type “byte”. 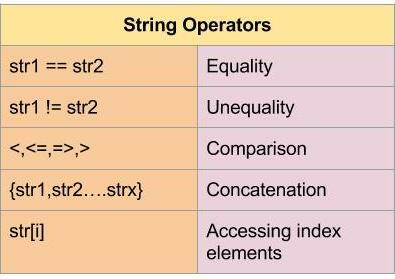 In addition, SV provides number of methods for String data type variables. Primarily these are – “len”, “putc”, “getc”, “toupper”, “tolower”, “compare”, “icompare”, “substr”. There are few more methods to support the conversion between asci to bin, hex, oct, int and vice versa. Please refer the SV LRM to get the detailed information on these methods. Lets move to the SystemVerilog supportted operators in a little more detail. 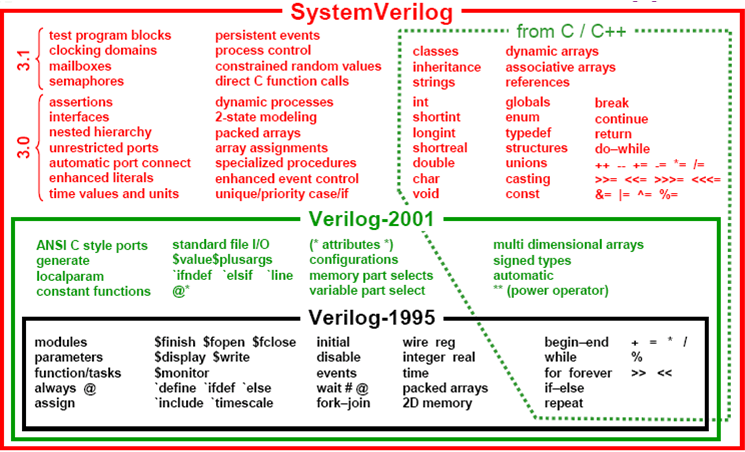 SV supports many standard operators most of which are carried forward from Verilog 1995/2001. Please refer the SystemVerilog LRM (Language Reference Manual) or text books to get the detailed information on these operators. typedef int unsigned my_intA; // 32-bit unsigned interger, unsigned is used since int is by default signed. An Enumerated data type allows us to define strongly typed variables with a group of unique constants which are related to each other. Enumeration types makes your code easier to write and maintain. Enumerated type automatically gives an unique value to each name in the list. An Enumerated type is stored as int unless we specifies otherwise. It’s a good coding practice to have _e with the variable name to clearly indicate Enumerated type. Enumerated type support several methods to stepping through the names in the list & these are – first(), last(), next(), next(N), prev(), prev(N). Please find details of each of these methods in SV LRM. In Verilog, text macros (`define) were used to define the constants which were global in nature so sometimes its a good feature to use the macro anywhere but at times it turns out to be a challenge in dealing with the local constant. Verilog ‘parameter’ was loosely typed so its scope was limited to a module. In Verilog 2001, parameter are made typed parameters but scope was still the limitation. In SystemVerilog, parameters can be part of ‘package’ and can be used across multiple modules. In SystemVerilog, Run-time constant i.e. const can be initialized with-in the declaration but can not be over-written with-in the procedural code. In SystemVerilog, there is no need to have low and high array limits (as it is required in Verilog). We can create multi-dimensional array by declaring dimensions after the variable name. There is a concept of packed and unpacked array in SystemVerilog, lets talk about it and go through some of these examples too. Its very critical to understand that most of the SystemVerilog simulators stores each element of the array on a 32-bit boundary, so a byte, shortint & int are accommodated in a 32-bit word. Yet longint consume 2 WORDs. From the packed and unpacked diagrams, its clear that its all about how we’re going to use the available memory, so its important to use the right set of syntax to fulfill the requirements. The challenge with Fixed Size Arrays (Verilog supported) is that the memory is allocated at the compile time itself and that much memory is blocked even if that the allocated memory is never fully utilized. It turn out to be the wastage of available memory (one of the critical computing resource). For example, if we’re planning for random size transactions simulation, in that case we need to have max fixed size array to take care of maximum size of transaction even though smaller size transactions do not require that much memory to be allocated. SystemVerilog helps to resolve this challenge by introducing an array called “Dynamic Array“. Dynamic array allocates memory at the run time instead of the compile time. In case of our above example, allocated memory size will be dependent on the size of transaction at the run-time & memory may got released after the simulation is over. So we can utilized the memory in most optimal way. /// Deleting all the elements. Associative array are used when the size of the array is not known or the data is sparse. In principles, Associative array implements a lookup table with elements of its declared type. The data type to be used as index serves as the lookup key. num() & size() – Both returns the number of entries in the associative array. delete() & delete(index) – Deletes all elements & delete indexed element. exists(index) – Checks for the existence of the indexed element. first(index) – Assigns the first element to the index being mentioned. last(index) – Assigns the last element to the index being mentioned. next(index) – Finds the smallest index whose value is greater than the given index argument. prev(index) – Finds the largest index whose value is smaller than the given index argument. Queue is introduced in SystemVerilog. With Queue we can insert or delete any element without the performance hit as with dynamic array that has to allocate a new array and copy the entire content. Each element in the Queue is identified with a number, where 0 being the first element and $ being the last element. A Queue is analogous to one dimensional array which grows and shrink automatically. size() – Returns the no. of elements in the queue. insert(index, element) – Insert an element at the index position. delete() or delete(index) – Delete all elements or delete indexed item. pop_front() – Gives out the first element of the queue. pop_back() – Gives out the last element of the queue. push_front(item) – Insert the element at the front of the queue. push_back(item) – Insert the element at the back of the queue. Package is a SystemVerilog concept where we can define our common parameters, typedef, strings & other methods, in fact everything that is part of language which can be re-used in our project. Once we import a Package, all the properties and methods become part of Testbench. Package provides a declaration space, which can be shared by other building blocks. Package declarations can be imported into other building blocks, including other packages. If some properties with the same name is present in the module/testbench, in that case the one inside module/testbench overwrite the one inside the Package. As shown in the example above, imported string ‘message’ is overwritten by the local ‘message’ variable. Static casting converts between two data types without checking of values. Conversion between integer and real is such example. With all this information being shared, I would like to conclude this blog here and hope it will work for you as outlined by me in the beginning of this post. I wish all the success for you, see you again soon, bye!